Weber's return couldn't come at a better time for Habs - The Point Data-driven hockey storytelling that gets right to the point. 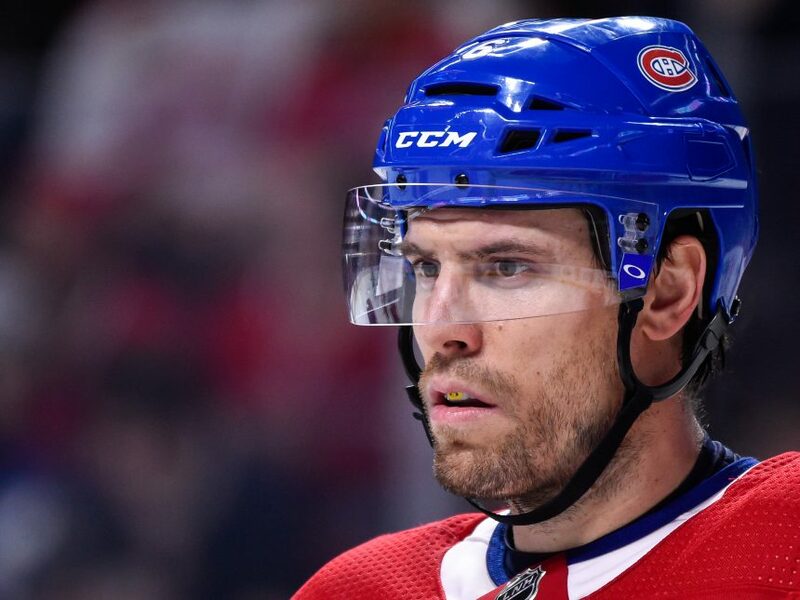 Shea Weber will suit up for Montreal tonight for the first time in almost a year and his arrival couldn’t have come at a better time for the Canadiens. The Habs have lost 4 straight games and are clinging to the final wild-card spot in the Eastern Conference playoff race. If you think goaltending is what’s sinking this team right now, think again. 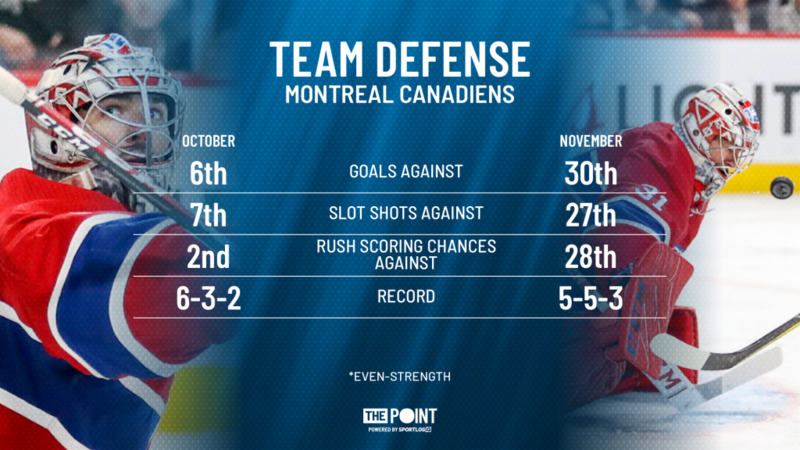 There is no greater area of concern for the Canadiens right now than team defense, which has been significantly worse in November than it was in October. Despite less than stellar goaltending from Carey Price and Antti Niemi in the first month of the season, the Canadiens actually did a good job of defending in-zone. At even-strength, the Habs ranked top 10 in total shots against, high-danger shots against and goals against. When Montreal did allow a shot from the high-danger slot area, it did a good job of pressuring the shooter, only allowing an open look on 32% of the shots it faced from the slot, good for 3rd best in the league. Fast forward to November, and it’s been open season in the Canadiens zone. At even-strength, the Canadiens are allowing almost twice as many goals per game in November as they did in the first month of the season. Since the calendar flipped to November, the Canadiens are allowing a ton of shots from the slot and passes into this area, which has created a high number of east / west, backdoor goals. It’s no secret the goaltending hasn’t been adequate in Montreal this season but no goalie in the world is stopping a majority of the chances this team has been allowing lately. What really jumps out on the graphic above is the massive spike in the amount of chances Montreal is allowing off the rush. 2nd fewest in October, 4th most in November. A majority of even-strength goals are scored within 5 seconds of entering the attacking end so being able to disrupt entries at the blue line and limit speed in transition is key in limiting dangerous chances against. The Canadiens are allowing over 5 even-strength scoring chances off the rush, per game, in November, which equates to an average one goal against per game based on league average shooting percentages in this particular situation. Like any player, Weber has his strength and weaknesses – defending entries is a strength. Weber ranked top 15 among defensemen in his first two seasons with the Canadiens in zone denial rate, which measures how often a player is able to prevent clean entries into their defensive zone. In the 2016-17 season, Weber had the best zone denial rate of any Habs defenseman at 52%, the only Montreal blueliner to crack the 50% mark. In limited action last season, Weber was again over 50%. This isn’t to say that the Canadiens defensive woes of late will magically cease to exist thanks to the return of one player to the line-up but Weber should help in limiting the amount of clean entries and rush chances the Canadiens have been allowing recently. Knock that number down and life gets a little bit easier for Carey Price who needs whatever help he can get. Team defense has been Montreal’s greatest area of concern in the month of November and there aren’t many players better suited to help a team in that area than Shea Weber. Will his return to the line-up prove to be a turning point in the Canadiens season? Will he be able to play at the level he’s used to playing at right off the bat? Time will tell. One thing is for sure, Weber and the Habs will have their hands full tonight against a Carolina Hurricanes team that throws everything but the kitchen sink at the net. The ‘Canes lead the NHL in shots attempts and shots on goal but good news for the Canadiens, they don’t generate a lot off the rush as Carolina ranks bottom 10 in rush scoring chances this season.